This article was originally written in 1994 but may well be of interest as it touches on hospital buckles as well as badges. My collection of both has considerably expanded since then. Several years ago when I first started collecting nurses’ and hospital badges, my enquiries at antique fairs invariably met with a response about nurs­es' buckles. I would explain to the dealer that on completion of a nurse's training, the hospital usually gave, or sold, a badge to show that they had quali­fied there. Now at least they know what I am talking about. As regards buckles, it is the tradition for trained nurses to wear a buckle on their belt; this is usually silver and is often Victorian. This is the only bit of individuality that was allowed in a nurse's uni­form. The buckles are normally worn with a black petersham belt (petersham being a kind of material). The UCH buckle illustrated is the only silver one in my collection (it has a London hallmark of 1938) - later examples may not have been silver. It shows the arms of the hospital - which is blazoned as 'an ancient galley, charged with a serpent nowed and in chief two maple leafs slipped' - and the motto `Ratione dirige cursum' (roughly translated as ‘pursue proper studies’). A variety of badges has been issued over the years both by the nurses league and the hospital - not all of which are in my collection. All of the badges show a pale blue bend sinister between dark blue and brown enamel. This is the only example I have where there is absolutely no similarity between the hospital badge and its buckle. The Westminister Hospital buckle shows the portcullis which appears on the Westminster City Council coat of arms with an imperial crown and a wreath of oak leaves with acorns. I have two versions of this buckle - one has the portcullis in gilt. The older Westminster Hospital badge is quite different from this buckle and is a brass oval with red enamel showing the back view of a nurse - it is in fact a badge issued to raise funds for the hospital. 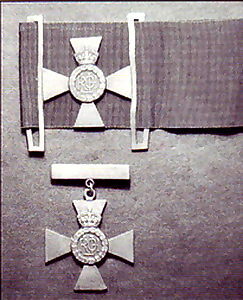 The later badges have the same design as the buckle with writing replacing the oak leaves. There are also silver and base metal badges issued by the League of Nurses with blue rather than green enamel. Also in Westminster is the children's hospital which was originally called the Infant's Hospital Westminster. This had 100 cots for infants aged 0 to 5 years. 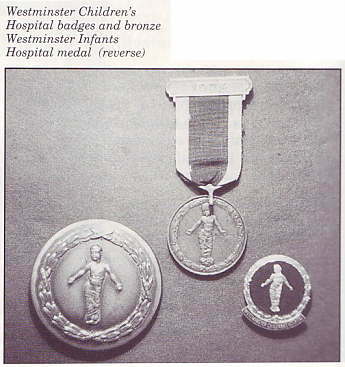 My example of a bronze 1924 medal shows on reverse an infant in swaddling clothes surrounded by a laurel wreath. This design is virtually identical to the buckle which was presumably issued by the hospital. Also shown is a later badge with the same motif issued after the hospital changed its name. The buckle for The Royal London Orthopaedic Hospital (now known as Moorfields) is bronze and is attached to a purple petersham belt. This central part is identical to the badge which was first produced in 1927 or 1928 - it was known as the Moorfields Cross. In 1933, the hospital was affiliated to the Charing Cross Hospital and the badge changed accordingly. The buckle was almost certainly in use only in that five year period. This illustration is from a St Helier Hospital. St Helier was a sixth century Belgian saint who was martyred in Jersey. Both the buckle and badge show the saint's head surrounded by green enamel. This is the only enamelled buckle that I have. Until I started to research for this article, I had assumed that they had come from St Helier, Jersey; however, I have discovered that there was a St Helier Hospital in Carshalton, Surrey, which had 763 beds in 1953 (the badge is hallmarked 1946). What was certain is now confused! A very recent example of hospital buckles is one produced in 1993 by the Royal Victoria Hospital, Belfast for nurses who had trained there or worked there for at least 6 months. The central motif is similar to the badges shown with the lamp of learning. The buckle has been produced in silver and base metal (I have neither). The badge is to be discontinued this year as the training school is being moved from the hospital. 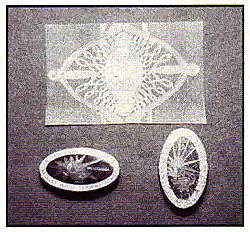 I am aware that Southend General Hospital started in 1961 to present the Lady Foster Taylor Buckle showing the Prittlewell Lily which was on the seal of Prittlewell Priory whose ruins are in Southend. 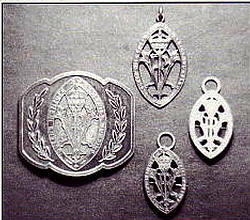 The lily was also used on the prize medal and probably also on the badge. I have nothing from this hospital. Institutions also issue buckles and badges. In 1926, the Queen Victoria Institute for District Nurses changed its name to the Queen's Institute for District Nursing. This later institute produced a variety of badges, mainly in bronze, with a VRI monogram and an imperial crown; they also produced a buckle showing the badge surrounded by laurel leaves. In 1972, the name was changed to the Queen's Nursing Institute. 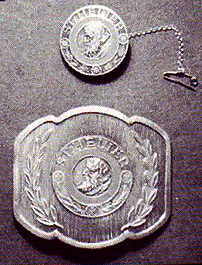 Other buckles may have been produced under different names. The most recent addition to my collection is a very modern example from Queen Alexandra's Royal Army Nursing Corps. This shows an imperial crown above a Danish cross with the initial 'A'. The illustration accompanying that is a cap badge (I do not have the nurse’s badge). 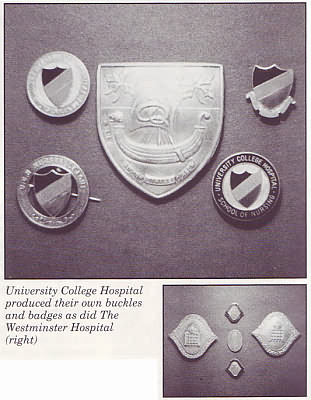 I would be most interested to hear from readers of any other hospital buckles and badges. With the continuing re-organizations of the National Health Service and closure of hospitals, such articles tend to be the only things which link with the old hospitals.